Before we begin, please take a minute to read the Installation Guide. By installing any necessary dependencies beforehand, we’ll be able to get our application up and running smoothly. At this point, we should have Crystal and Amber installed. We should also have PostgreSQL and NodeJS installed to build a default application. -d This specifies the database driver to use. It defaults to pg, for PostgreSQL. -t This specifies the template rendering engine. It defaults to slang, the Slim-inspired templating language. --deps This will download and install project dependencies for you, to save the additional step of having to type shards install. Amber generates the directory structure along with files necessary for the application. Amber makes it easy to interact with your database. Amber supports Postgres, MySql, and Sqlite. Amber looks at the database_url key for the default database connection string. Amber assumes that your PostgreSQL database will have a postgres user account with the correct permissions and no password set for this user. If that isn’t the case, update the database_url key with the correct database credentials for your environment. By default Amber accepts requests on port 3000. 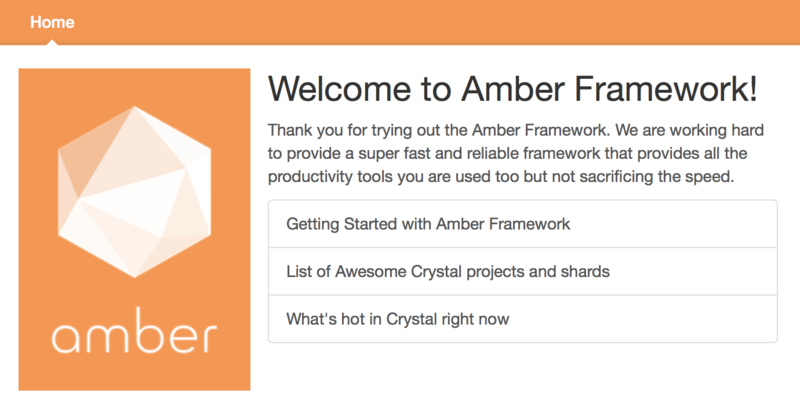 If we point our favorite web browser at http://localhost:3000, we should see the Amber Framework welcome page. If your screen looks like the image above, congratulations! You now have a working Amber application. If you don’t see the page above, try accessing it via http://127.0.0.1:3000. Locally, the application is running in a Crystal process. To stop it, we hit ctrl-c once, just as we would terminate the program normally.